Simple. Effective. Space saving. Wire shelf dividers and ledges attach to your wire shelving unit and allow you to better sort your items. When you are able to place items in their right place, organization is no problem. Wire shelf dividers allow you to intelligently arrange your belongings, giving you the ability to store items vertically without worrying that they might tip over and fall. Ledges are there to catch and hold any items that might roll off the sides or back of your shelving unit. Our wire shelf dividers and side ledges are commercial grade silver finish for maximum durability. They attach on the shelf to keep your items securely in place, creating cozy little cubbies for stacking clothing, accessories or books and photo albums. They are easy to put on and divide the shelf with ease, giving you the option to stack items into neat little piles that stay put. Space saving wire shelf ledges let you stack items on your wire shelving unit to maximize its carrying capacity. Used to keep your items from falling off the back of the shelf, they fit tightly to the shelf and do not wobble. It feels good to have organization and maximization of space. These products help you create a more efficient and stress free home. 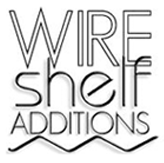 Wire Shelf Additions creates solutions that cut down on the amount of time you have to hunt for things.